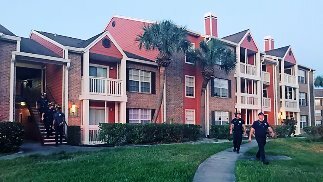 ST.PETERSBURG, Fla. — Growing concerns about a number of St. Petersburg homes and the safety of families living there after firefighters have been called in to inspect a condominium building after cracks appeared. The condo building at Vantage Point has not been officially evacuated yet, but building inspectors will not be out until later Monday to figure out exactly what is going. However, they know something is going on after what is described as several large cracks spotted at not just the foundation of the condo building, but also an upstairs unit. The St. Pete Fire Rescue responded over the weekend and taped off parts of the building where the cracking was discovered. A maintenance man for one of the unit's who discovered the cracks says there have been problems at the condos before, but nothing like this. "I didn't see this before. I know they have treated for termites and other stuff, but this is the first time I saw the foundation cracking this bad, really bad," said Ricardo Davila. Davila told Spectrum Bay News 9 that he started noticing cracks in the foundation in the stairwell and once he got upstairs he spotted a large crack from one end of the building to the other with the porch not looking structurally sound at all. The St. Pete Fire Rescue responded over the weekend and taped off parts of Vantage Point Condominiums where the cracking was discovered. The St. Pete Fire Rescue said Sunday night said one to two units may have to be evacuated on Monday depending on exactly what building inspectors find.